A couple of months ago South African beauty girls received the great news that Real Techniques makeup brushes were starting to make their way onto the shelves of selected Foschini stores. I was ecstatic because Real Techniques brushes are definitely very high up on my favourite makeup brush list. Plus a large number of their face- and eye brushes, and a cute little egg-shaped sponge have found a loving home in my brush collection. In the past, I was forced to either import their brushes using websites like Feelunique and Look Fantastic, or ask beauty mules (friends visiting from the UK) to bring a couple of their brushes back home for me. I remember receiving my first set of Real Techniques brushes about 2 years ago, and it was love at first swipe. Their bristles are incredibly soft, their handles very sturdy, and they ensure makeup application is a absolute breeze. By the way, current Foschini stores that stock Real Techniques brushes are: Menlyn, Canal Walk, Cresta, Gateway Centre, Somerset Mall, Westville Pavillion, Chatsworth, East Rand Mall, N1 City and Tygervalley. I have featured Real Techniques brushes in numerous blog posts and YouTube videos, but always felt a little bit guilty because they were not readily available in South Africa. That’s all in the past now, though, because Real Techniques has already rolled out to selected Foschini stores, and will be rolling out to a lot more Foschini stores soon. Keep an eye on the Real Techniques SA Facebook page here for news on additional stockists and new product releases! I immediately sent my contact at Real Techniques South Africa an email asking for more info, here’s what she told me: The ONLY Clicks store that currently stocks Real Techniques makeup brushes is the Clicks in Eastgate Shopping Centre. I’ll keep you updated on additional stores, but for now, that’s the only store. ♥ The brand was created by Pixiwoo sisters, Samantha & Nicola Chapman, back in 2011. Sam & Nic are pro makeup artists and beauty vloggers with an impressive YouTube channel that boasts more than 1,8 million subscribers. Their makeup tutorial videos are informative and inspiring, plus they break each makeup look down in simple easy-to-follow steps, making it easy to recreate. 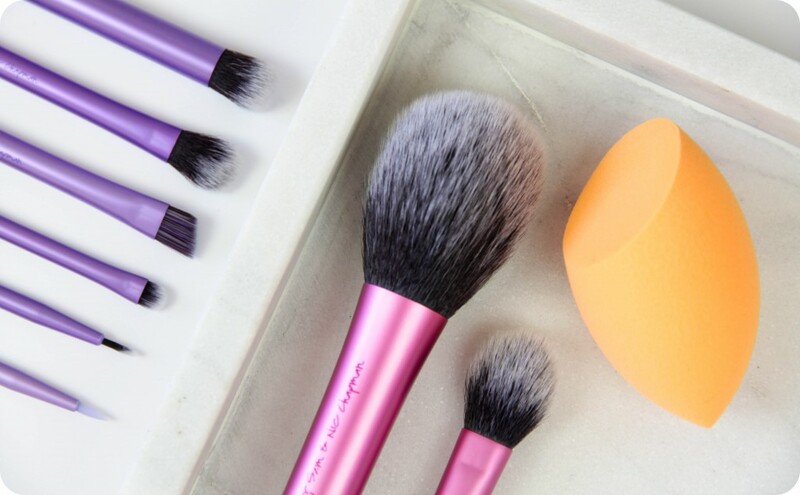 ♥ The brushes feature synthetic bristles (100% cruelty-free) that are ultra plush & smoother than the hair you’ll find in other natural hair brushes. The soft fibers help create a flawless , high-definition finish in any type of light – from sunlight to harsh indoor light. ♥ Most brushes are self-standing for easy storage & the extended aluminium handles are light & easy-to-use. ♥ The collection is suitable for a wide range of products & every makeup need – from powders, creams & liquids to mineral makeup. ♥ Each brush head is hand-cut to the perfect shape, allowing for precise application from dense coverage to a soft, delicate finish. ♥ The colour-coded system corresponds to the key steps of makeup application. The golden yellow brushes create a flawless base (foundation, concealer & powder), the fuchsia pink brushes are for finishing off the complexion (bronzer, blush and highlighter), and the purple brushes enhance the eyes (eyeshadow shading & blending and eyeliner). 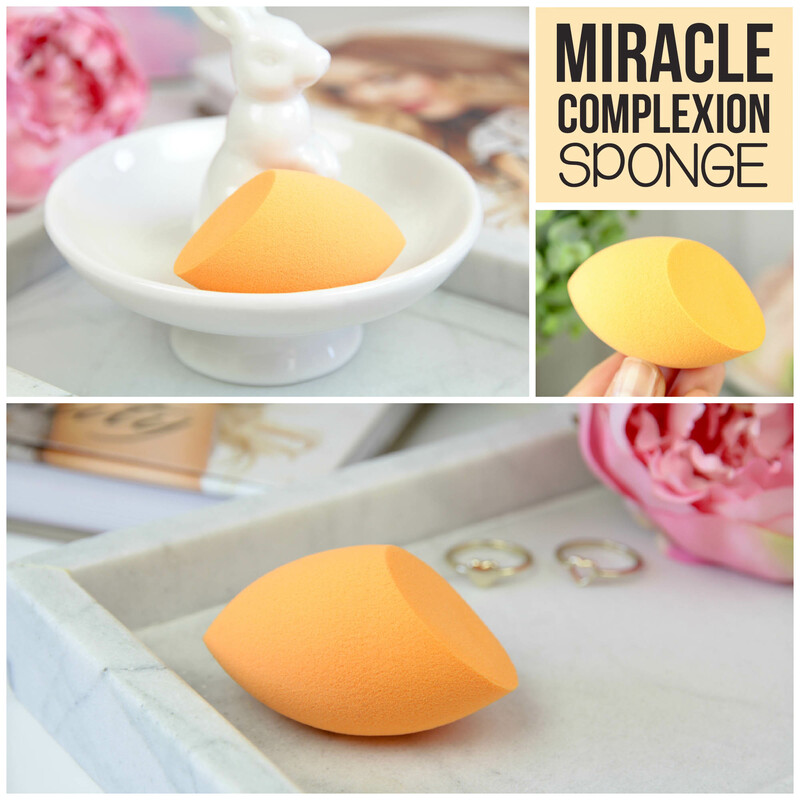 Real Techniques Miracle Complexion Sponge ♥ R 119,95 – Features a pointy egg-shape on the one end and a slanted flat edge on the other. Use the flat slanted edge to get into all those nooks, crannies and crevices on the face i.e. around the nose and under the eyes, and the larger rounded sides of the sponge to apply foundation to the rest of the face. The precision point can be used to apply concealer to the inner corner of the eye or to spot-conceal. The Miracle Complexion Sponge ensures your foundation looks like skin, it sheers out makeup to give you a natural and flawless finish. You’ll never have to worry about going out in public with foundation that looks cakey ever again. Dampen the Miracle Complexion Sponge before applying your foundation or concealer, this ensures an even & airbrushed application. 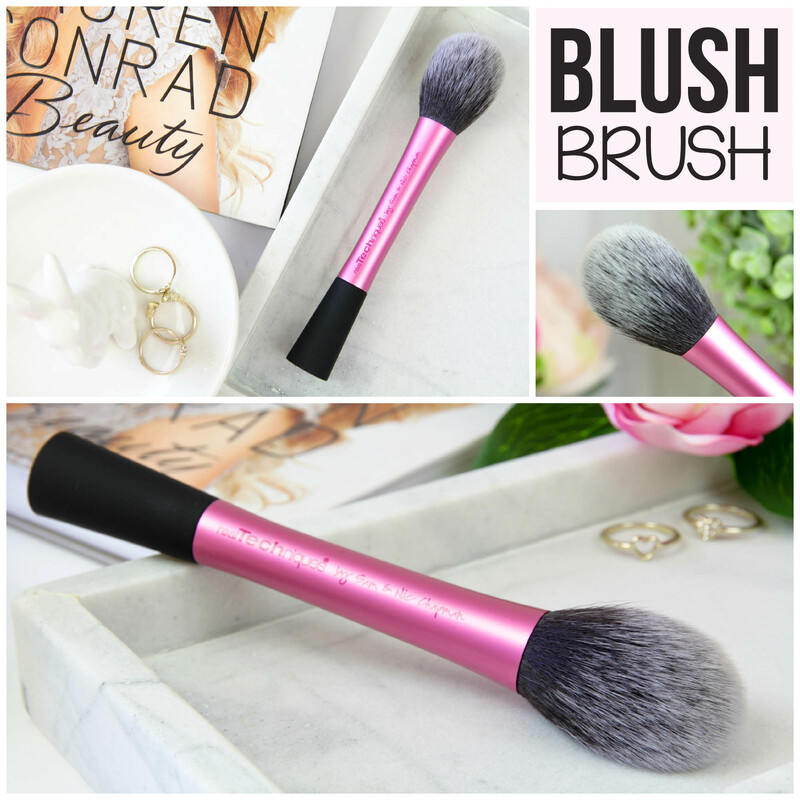 Real Techniques Blush Brush ♥ R 169,95 – This is one of my favourite face brushes in my makeup brush collection. The bristles are synthetic (100% cruelty-free) and super soft, this means the brush blends cream and powder products like an absolute dream. I have used this brush to apply blush, bronzer and highlighter products, plus I have also contoured using the slightly pointy tip. Real Techniques Setting Brush ♥ R 99,95 – This is the ONLY brush I use to set my under eye concealer. I find it is small enough to fit comfortably under the eyes and in the inner corners, plus the synthetic bristles are incredibly soft making it perfect for the delicate eye area. This brush can also be used to highlight areas on the face using cream, liquid or powder products. I have also applied liquid concealer to my under eye area using this brush and find it blends flawlessly. Real Techniques Starter Set ♥ R 299,95 – This brush kit is all you need for a complete eye makeup look. The set features a base shadow brush for applying eyeshadows to the lids and brow bone, a fluffy crease brush that effortlessly blends shadows in the crease, a tiny accent brush for highlighting the inner corner of the eye or smudging eyeliner on the top / lower lash line, a brow brush that can be used to apply both cream or powder brow products, and a fine tip liner brush that creates a precise line using gel or liquid eyeliner products. The set comes complete with a panoramic case, which can be used to stand and store your brushes upright on your vanity (the case also makes this set travel friendly). Real Techniques Silicone Liner Brush ♥ R 119,95 – This is a newbie in my makeup brush collection, and I think it is going to become a firm favourite soon. It features a small tapered flexible silicone tip for precise application of liquid, cream or gel eyeliner products. I have enjoyed using this brush because it glides across the eyelid quite effortlessly, and I am able change up liner colours without having to wash the brush each time, all you need to do is wipe the tip on a tissue to remove all product & start again. This liner brush is very easy to use, plus the extremely fine tip enables you to apply liner deep down in between your lashes (tight lining). You can create a very, very fine line with the brush for a subtle everyday makeup look, or you can create a bold wing for a dramatic eye look. Real Techniques South Africa contacted me and asked if I would be interested in collaborating on a giveaway. I was quite sure my readers would LOVE to stand a chance of winning a hamper filled with their brushes, so I promptly agreed. Let’s get to the good stuff, the giveaway hamper will contain ALL the Real Techniques products I have reviewed in this blog post. That means the hamper is worth over R 800,00! IMPORTANT: If you follow my blog on Facebook, you will know that this was initially a ‘Facebook-only’ giveaway. Since Monday I have received a lot of emails and messages from my readers asking if I could add more entry options as there are people who are not comfortable sharing competition entries on Facebook (they don’t want to spam their friends). I’ve also noticed with previous giveaways that some people share Facebook posts privately, and it’s 100% their right, but that means I can’t see their entry or name, so in the end I can’t count their entries. I thought about it for a few days, and decided to create a new giveaway from scratch using the Rafflecopter widget – that way you can gain entries by following, tweeting, sharing and commenting. More entry options means better chances of winning the prize if you decide to make use of all the entries, right? ♥ The giveaway starts today and Rafflecopter will choose a random winner on the 31st of July 2015. ♥ The giveaway is open to South African residents only. ♥ Real Techniques South Africa is responsible for sending the prize to the winner. The blush brush and the blender have my name written all over them 🙂 such an amazing addition to my beauty regime, would love to be able to try them out! Oh my god, I woud love to win this prize! I don’t own many brushes, so really need this. I only recently really started wearing more makeup, previously it was a base, some blush and mascara. I have now moved into experimenting, and even using false lashes lol. I don’t have brushes, so this would be amazing, but my heart covets The Miracle Complexion Sponge the most. These Brushes look incredible. I have been trying to find good ones for a while now and I think these might just be them! I am in need of a new set of brushes! Throughout my years of watching YouTube tutorials, including yours, I’ve seen these brushes and hear nothing but great things about them. YAY!!!! i cannot wait to start using these brushes!! Gosh those brushes looks amazing! Been hoping Foschini would stock these in PE, but so far no luck 🙁 I’d love to win these! I so badly want the blush brush! It looks so super soft….and it also has multi uses as seen in the review above! Also seen it in action on you tube videos and I really just can’t wait to own one and stroke it on my cheek for no reason like a crazy lady! I went all out and bought the Original Beauty Blender a few weeks ago. This weekend I had the pleasure of using my sister’s Real Techniques Miracle Complexion Sponge and I was seriously disheartened to realise that I WAY preferred it compared to the one I spent a fortune on. I’m going to donate my BeautyBlender to my mom and hold out for one of these Real Technique babies! The texture was soft, the material super fine for that airbrushed look and the flat edge a really awesome angle to get into the nooks and crannies. Real Techniques Silicone Liner Brush ♥ it’s new and worth a try! These make up brushes look amazing. I have been wanting to get a set for ages. Such a great giveaway! Fingers crossed. My heart covets the Pink Setting brush. It is hard to set foundation with a normal big powder brush! I would love to win this competition. The setting brush looks like a game changer! Covetting these brushes after seeing big beauty youtubers rave about these brushes. I’m so stoked that they are no in Clicks which means I can use my points towards them. These brushes are everything! Flawless application and buff out like a dream. To have those soft bristles on my face will make my journey to becoming a household name beauty blogger like yourself happen sooner than later. Stunning brushes, I currently own 1 and cant wait to grow my collection! I am desperate to get my hands on some real techniques brushes!!! They are amazing!!!! Ohh, been seeing a lotof vloggers use them and always wanted to give them a go. I love the look of the Blush brush. I have been using the same MAC one for so long now that I think it’s time I retired it and tried something new, and what better than this beauty! Oh wow so need these in my life!! O have really not been one for make up – but am now seeing the absolute need for it and how beautiful it can make you look. These brushes will be great to start my make-up journey. Perfect tools will create the perfect look. I’d love the eye shadow brushes! There are so many beautiful looks I could create. Besides – you can never have too much makeup or too many brushes! Would LOVE LOVE LOVE some of these amazing brushes. …pretty please! The sponge, I love a damp sponge to blend my makeup, and would love to try this! The ‪#‎RealTechniquesSouthAfrica‬ starter set is EVERYTHING! I just recently learned how to do eye make-up properly (without looking like a sparkly racoon) and this set is perfect to get it all absolutely on point. Also, I prefer elaborate eyes more than any other make-up look, hence the work at perfecting it. In addition, Real Techniques South Africa brushes are on every make-up lovers wish list, I am sure because it is definitely on mine. I dream of owning the entire collection one day. Would love to win this set! I would die to win this!! Love Love Love this giveaway! !…Have been waiting to get my hands on these beauties but never got to decide which one to buy first. The sponge looks so good and I am sure it will be as good as the beauty blender at half its price. I would love the eyeshadow brushes!!! Great pics and post! The sponge sounds lovely to use! 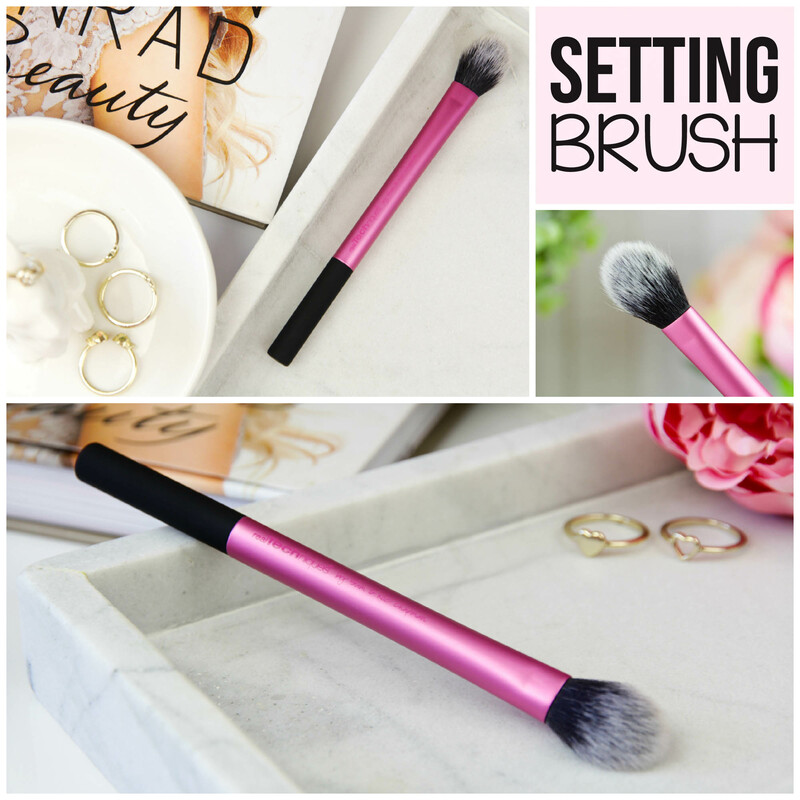 Definitely coveting the setting brush – I got someone to buy me the expert face brush a while back when they were visiting the UK and it’s still my favourite brush – quality of the brushes are so great! I am completely obsessed with my RT brushes! I have one brush that I use to apply blush but no other brushes. Winning this would allow me to apply make-up more easily and will look more professional. I love the Real Techniques Setting Brush as I have a sensitive eyes and am sure applying make up under the eye area will be a breeze with the super soft bristles. Another favourite would be the Miracle Complexion Sponge. Real techniques brushes are by far the most affordable and yet don’t compromise on quality! Those brushes look amazing! It’s so hard to find decent make-up brushes these days. That Miracle Complexion Sponge looks like it works wonderfully. Don’t really know how this widget works but I would love to win these brushes! Can’t wait for them to be available in a shop near me! I had no idea that Real Techniques was by the Pixiwoo sisters! I love them! I only have one (very tired) brush that I use for face powder so I’d seriously love to try the Real Techniques Starter Set to apply eye makeup with. I usually resort to using my finger to put my eye shadow on and needless to say, it doesn’t always work!! I’ve seen how stunning makeup applied to the eyes is when using a brush, and would love to try it. Thanks for yet another fabulous giveaway! I ordered my first Real Techniques Expert Face Brush from abroad a year ago, and was so chuffed with the brand! I would LOVE the starter kit as I always need doubles for my eye makeup brushes when they are being cleaned! I really love the silicone liner brush. It’s hard to pick just one brush as all the brushes make my heart skip a beat, but i think the starter set would be essential to a “newbie” make-up freak! I would love for you to do a tutorial on your favorite Real Techniques brushes and how you use them? I know pixiwoo do it themselves, but its always nice to get a South African’s opinion. I’d love to win the miracle complexion sponge! My sister kindly donated 2 make up brushes to me a few months ago and I didn’t know what the big deal was about fingers vs brushes. Well now i do and would love to add this sponge (and brushes) to my very small collection. I’d love the setting brush! But if I have to choose I'd say the Real Techniques Silicone Liner Brush. I cannot go a day without my winged liner! Hi! First of all, I would like to thank you!! I stumbled across your blog and I nearly had a heart attack. I can’t believe I have found someone that has exactly the same in common as I do. The products you talk about and the need to have makeup that you can only import … It really blows my mind. I have searched high and low and have finally found such a great and organised person that can give me all the info I need on great products! Definitely the starter kit! I am all about the eyes, so NEED it. The starter kit and blush brush looks amazing! So glad they’ve become available in SA. My heart wants that blush brush so bad! I have the Core collection but am DYING to get my hands on the starter set! These brushes are a game changer!! OH WOW!!!!!!!!!!!!!!!!!!!!! I need to have this!!!!!!!!!!!!!!!! Absolute Beauty Lust Item! Love Pink Peonies! Love Real Techniques! Love Competitions like these! I’ve never been more excited at the prospect that a brand is coming to SA! I recently bought some of the golden brushes and immediately fell in love… now I want them ALL! I would love the blush and setting brushes! I would really love the Real Techniques Miracle Complexion Sponge to put a stop to cakey makeup on my forehead! I don’t think I can decide which one I want. I want to go and get them all. I have waited forever for these brushes to get here finally! I hope they bring their gold brushes too! Wow it’s so amazing that Real Techniques are more readily available in SA because I do agree that they are super affordable for their amazing quality. I would really like to try out their silicone liner brush and miracle complexion sponge. How do you think it fares up to the Original Beauty Blender? Another awesome giveaway, Thanks Luzanne. Love this…. need this…… want this!!!!!!!!!!!!!!!!!!!!!! im coveting the setting brush! I would love to have the setting brush in my collection. It could actually have so many different uses!! Awesome giveaway! Thanks Luzanne! Being an avid follower of the Real Techniques YouTube channel I’ve seen the wonders of all their products! They’re expertly designed by people who know and love makeup! That being said, I do believe the Miracle Complexion sponge goes above and beyond! I never knew a simple sponge could make a persons make up look hat great, I also love it’s multifunctionality! If I were to buy a single Real Techniques product – this would be it! I’d love to try the Silicone Liner Brush. Maybe this is what will finally help me achieve decent winged liner? The Real Techniques Starter set is by Far the one I’m most excited for. Its perfect for beginners AND more advanced makeup users! It has all the brushes to create the perfect look. The fact that the brushes are so affordable doesnt hurt at all!! I’m also REALLY lusting after the miracle sponge. It looks like anyone could really achieve a flawless base with it. The setting brush and miracle complexion sponge is definitely on my shopping list 🙂 Hope they stock the other Clicks stores soon! Jy het my al so ver gekry om n paar Cala borseltjies aan te skaf, sal moet hoor hoekom al so mal is oor RL, maar eks te onhandig met die borseltjies, die spons ene lyk beslis na iets wat beter vir my sal werk. Jou fotos is pragtig! Daar is seker net soveel wat mens kan doen met borseltjies, maar jy laat dit mooi lyk! Thank you for such an informative post! I did not know Menlyn stock RT brushes! I phoned Edgars’ head office and they said Menlyn does not have it. Whaaaat?! Anyway, I am so happy. Thanks, again for the info and beautiful photos! I would looooove to win this hamper! I am a sucker for anything eyeliner related, and constantly searching for the perfect eyeliner brush to use with a gel liner. This is such a great give-away!! 🙂 Been really hard to find the Real Techniques brushes around my area at Foschini Stores without having to travel kms or spending loads on shipping from overseas so I’m glad it’s finally coming to clicks. Hopefully it will be in my area soon! Been so excited for a giveaway like this! These brushes are so lovely. What a wonderful give-away, these brushes have been on my wish list for ages! I can’t believe they are finally going to be stocked in Clicks stores! I really can’t wait until they are stocked countrywide. Everyone needs access to these perfect brushes. Oh and I think my favourites are probably the Complexion Sponge and Setting Brush! It is a bit expensive for a student budget and I’m always stuck between buying the brushes for myself or makeup for the blog.. and well I love blogging so you know which side wins. Thanks for always having such amazing giveaways Luzanne! The Real Techniques Miracle Complexion Sponge! I need this in my life. I love all the real techniques brushes but definitely need the setting brush! The setting brush looks amazing! Love the fact that you can use whatevef medium of make up your have 😀 like cream, liquid or powder!!!!! Ive read so many fantastic reviews about the Real Techniques silicone liner brush. I cant wait to try it out myself!!! The Real Techniques Silicone Liner Brush looks amazing! I’ve never seen anything like it and would love to give it a try! I’m really intrigued by that silicone liner brush. I would really like to try that! I have been eyeing the *blush brush* for so long! It looks so unique…I just want to feel those brushes! They look so fluffy. I’ve never tried any of these brushes so I’d love to see what the hype is all about! The silicone brush has definitely piqued my interest. What a wonderful giveaway! I have my eye on the blush brush and complexion sponge. Definitely the blush brush! I can’t wait to try these! I would love to have them all, but the blush brush would be the one I covet most. I have been in love with these brushes for so long!! Would be a dream come true to win! The blush brush. I NEED. I WANT. 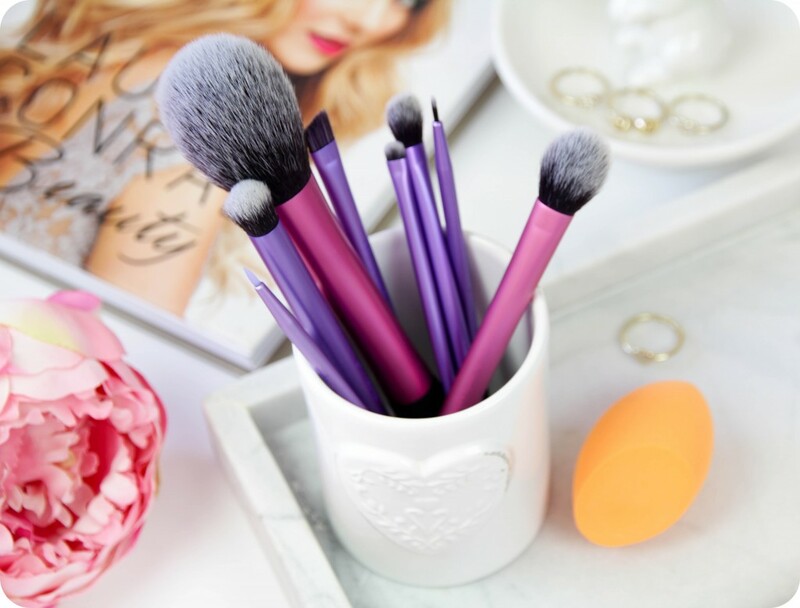 I’ve heard some amazing stuff about these brushes – it would be so incredible to win the set! I would love the setting brush!!! My heart wants the Miracle Complexion Sponge! Cannot wait to get my hands on these brushes!!! These need to be in Clicks’ all over the country! I’ve wanted Real Techniques’ brushes since I started watching Tanya Burr about three years ago! So, I went to Eastgate, and found the brushes. Clicks Eastgate also sells Stila now, so weird! Anyway, they also have the Bold Metals Collection. Most of the other brushes are alreayd sold out, but they had all of the bold metals left. This blog post is like an answered prayer. I was looking at these Real Technique brushes yesterday at Foschini but didn’t fully understand the range and use of the various brushes. This post is beautifully detailed and I now understand the range i.e. colour code etc. I only have the blush brush and love it. Need the yellow range especially the sponge. Even if I don’t win the giveaway, I am still a winner because of this post!!! The starter set for eyes looks amaaazing! The Real Technique Starter Kit is the one I’d choose. Love the idea of the various brushes for specific areas of the eye (eg the accent brush that gets to the inner corner of the eye). I struggle with my current applicators and my makeup always seems a bit messy to me, with a lot of finger smudging) ‪#‎PinkPeonies‬ ‪#‎RealTechniquesSouthAfrica.‬ These applicators would make life so much easier! 🙂 Thanks for the great competition! Great post, I really enjoyed it and photography and editing skills are amazing. I have been wanting RT brushes for such a long time now. I ordered them on the real techniques website a couple of weeks ago and they should be coming soon, thanks for getting me excited about them arriving again! I’ve been searching for a decent brush set for a while – really helpful review! A decent set of makeup brushes can make all the difference in the world. mine have been through it all, and its about time they retire. their time to go was probably a while ago, but trying to find decent brushes that dont cost an arm and a leg is really difficuty. especially when you live in Pe and you are limited with where you can shop. The setting brush 🙂 I have the expert face brush and it is dreamy! Now I just need this one for my concealer and I can fool everyone into thinking that I have perfect skin! I am in desperate need of a good quality powder brush. The Real Techniques one looks what I am looking for! I would love the Real Techniques starter set. I’ve just started investing more time and money into makeup and my skin and just love your blog and well as Pixiwoo. Blush Brush for the win!! Love these brushes, Fingers Crossed. They really are amazing – I find myself reaching for these rather than any of my (much pricier) MAC brushes. Thrilled that they are becoming more easily available in SA! I’d really love to win this awesome giveaway! I’m so excited that Real Techniques has finally launched here in SA! I probably would have been left in the dark if I had not come across this article on your blog (thank you for that). I have admired the Miracle Complexion Sponge for a long time, and need to get my hands on it like, yesterday! I’ve heard so many great things about these brushes from the beauty world, and can’t wait to try them all out. From the brushes specifically, the setting brush intrigues me the most, although I would love to have them all. I covet the golden yellow brushes to create a flawless base (foundation, concealer & powder). The buffing and contour brush from their core collection is my fav, I am considering buying another set just for those two brushes alone! Just found this blog and I am in love! The blush brush is the one that my heart desires most…fingers crossed my luck comes through the time. I am definitely coveting the Eye starter kit! I love eyeshadow brushes. I would really really like to win this competition. In desperate need of good quality makeup brushes. Real Techniques Starter Set is what I need. I have one eye make up brush and I try to do everything with this one brush and I know it is wrong. Help me get on the right track. Would love to try the Silicone Liner Brush, went off gel liner for a bit and this might help me get back into it! The Real Techniques Setting Brush is the one I really have my eye on!!! The miracle complexion sponge is what my heart is after! Entered! Would love to win! The real techniques starter kit is my all time desire! the Miracle Complexion Sponge! want. I love the silicone liner brush. Winged liner for days! I would definitely get the Starter Kit….think that would be a “must have” item. Would just love to own the Real Techniques Starter Set. Also love that the set comes complete with a panoramic case, which can be used to stand and store your brushes upright on your vanity. Lovely set. This is a great give-away, LOVE IT! Would really like to win. 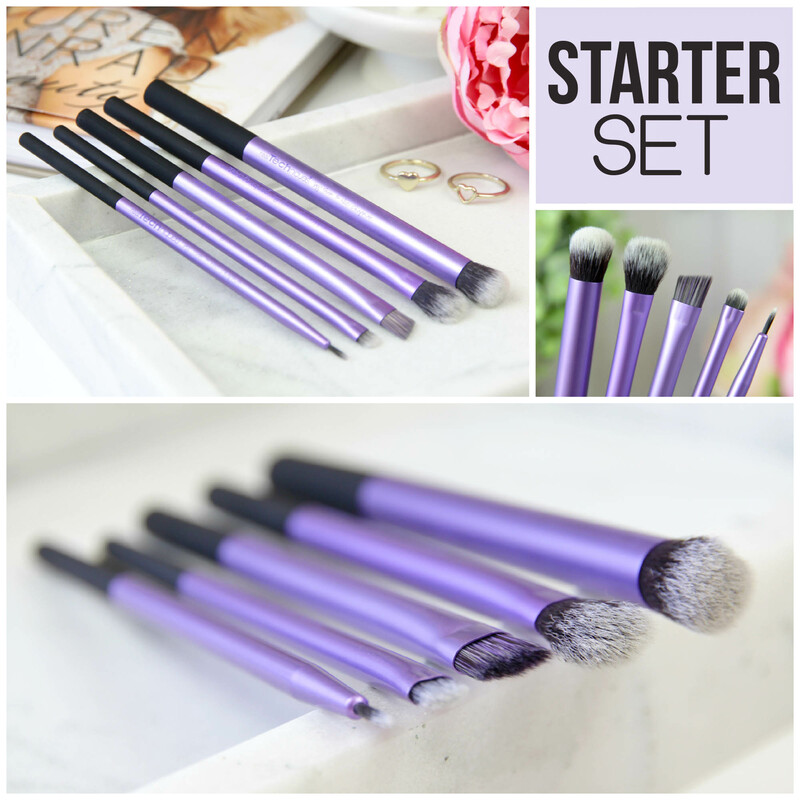 I am crazy about the STARTER SET, it’s all you need and dont have to try to do your eyeshadows with only one brush. I really have learnt so much from your tutorials, and really take a whole lot more care when i apply my make up. Having a set of professional brushes would really be great, Thank you for a wonderful blog. The starter set looks amazing. I would so love to win these brushes. I am always watching makeup videos for new inspiration & would love to own a set of gorgeous as well as decent(mine seem to only last a little while) brushes. These pink and purple brushes look soooo cute. Love love loooove the colors. My eyes are set on the Blush Brush… a little pop of color on the cheeks will never hurt anyone :D.
All look so good…but I love doing my Eyeliner so would go with that. I want the setting brush! my fingers are crossed for the complexion sponge. I WILL BE THE HAPPIESTEST WOMAN IF I WOULD. I NEED BRUSHES !!! I would love to have the starter set. I’ve was gifted the powder brush this week and it is divine. I’m an infant when it comes to make up application and only recently started using makeup and being interested in it. Well I’m sold – I would love to create different looks with the eyes and the starter set would allow me to do just that. Real Techniques Starter Set would be amazing to win! Actually had no idea I could find these brushes in SA until I read your post, thanks @pinkpeonies your review was also so accurate, hopefully o win and I get to try them out and maybe review them myself. Would love love love love LOOOOOOOVE to win this giveaway!!!!!!!!!!!!!!! Holding thumbs, fingers and toes and anything else that can give me luck!!!!!!!!! !